Basic essential tanks with adjustable strap good for exercise workout, gym, yoga, biking, and running, or every day wear, etc., adjustable strap convenient for adjusting to the length you need. The spaghetti strap tank top is made of modal and spandex, stretchy and comfortable; Long tanks to hide your belly and show your beauty of curves. 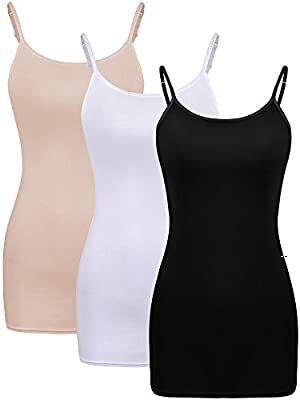 The basic and simple camisole with 3 different colors, good match with any of your clothes, underneath a cardigan or sweater, show your personalized dress. Hand wash recommended or dry clean, machine wash in cold water with like colors in case of fading, hang dry, not bleach. No built in bra cup.